(The Hulk: The End (fb) - BTS) - Following all of casualties during the Hell on Earth War, the (US?) government proposed and then completed the Costumed Adventurers Memorial Park. All those who perished during Hell on Earth were laid to rest there. (The Hulk: The End (fb) - BTS) - Those who fell in the Outer World War were laid to rest in the Costumed Adventurers Memorial Park. (The Hulk: The End (fb) - BTS) - Those who died of old age were laid to rest in the Costumed Adventurers Memorial Park. (The Hulk: The End (fb) - BTS) - None of the other heroes lived to see humanity fall to the one enemy they were helpless against: other humans. (The Hulk: The End (fb)) - The initial bombings were the results of terrorists acting outside government mandates. (The Hulk: The End (fb)) - The no one really wanted war, retaliation seemed the only possible response, and things spiraled out of control. (The Hulk: The End (fb) - BTS) - Heroes and villains alike, along with millions upon millions were killed in the nuclear blasts. (The Hulk: The End (fb) - BTS) - The Hulk derived some sort of grim satisfaction in mankind destroying itself, as if it validated the opinion he had held for so long. Not caring about the others who perished, the Hulk only cared about being the strongest one there is and about being left alone. (Ultimate Hulk novel: The Last Titan (fb) - BTS / The Hulk: The End (fb)) - The Hulk's ability to resist and absorb radiation made him stronger; and the ability to repair his damaged body to counter the effects of aging, allowed him (and Banner, albeit somewhat more slowly and far less efficiently) to survive. (The Hulk: The End (fb)) - Bothered by the noise of the explosions and the cries of the dying -- which may have offended his sense of order, jabbed at his conscience, or just served as an annoyance -- the Hulk returned to a cave near Desert Base, New Mexico, and sealed himself and Banner in, until all the shouting died down. Staying in the cave used little energy, and the Hulk was maintained by both the freefloating radiation and radiation-contaminated natural spring running through the cavern; both of these sources has a slow, visible effect on the Hulk. (Ultimate Hulk novel: The Last Titan (fb) - BTS) - Nuclear holocaust killed the rest of humanity. (The Hulk: The End (fb) - BTS) - Learning of the apparent demise of humanity, a number of alien races had a Rigellian Recorder sent to Earth to investigate, confirm, and record this. (The Hulk: The End (fb) - BTS) - Arriving on Earth, the Recorder eventually sensed that one human had survived. (The Hulk: The End (fb)) <Days, months, or years later> - A Rigellian Recorder rolled back the rock covering the Hulk's cave and confronted Banner, after which it expressed displeasure at confirming that his readings were correct, and that a human had survived. The Recorder introduced itself and explained that it had been sent there -- not to learn from humanity's mistakes to help other races, as Banner first thought -- but rather to to make certain that all of humanity was dead. It further explained that most sentient beings considered Earth to be a troublesome race, which would not be missed: The Kree and Skrulls had actually formed an alliance for the purpose of sponsoring a very festive celebration. Despite Banner's initial shock and subsequent outrage, the Recorder merely clarified its points. When Banner asked if the Recorder was going to kill him to make sure, the Recorder asked if Banner wanted him to...if he wished to die. When Banner said, "No...! ", the Recorder told him he would change his mind, but then clarified that he was only there to record, regardless. Concluding that its continued presence was not required, and that its presence might actually and inappropriately affect events, it -- before departing -- left behind a Vidbot to record on his behalf until it registered his demise, after which the Recorder would retrieve it. Still refusing to completely accept that everyone else had died, Banner wondered if there wasn't anything else he could do. The Recorder paused, sharing that there was something he could do: "If you should happen to address the Vidbot, please enunciate. Your species has...I'm sorry, had...a tendency to mumble." With nothing more than a "Farewell," the Recorder departed. (Ultimate Hulk novel: The Last Titan (fb) - BTS) - At some point, Banner suffered a broken leg that never healed properly, leaving him with a limp. (Ultimate Hulk novel: The Last Titan (fb) - BTS) - Apparently mutated by radiation and/or otherwise continuing to evolve, cockroaches became powerful enough to devour the Hulk's flesh. 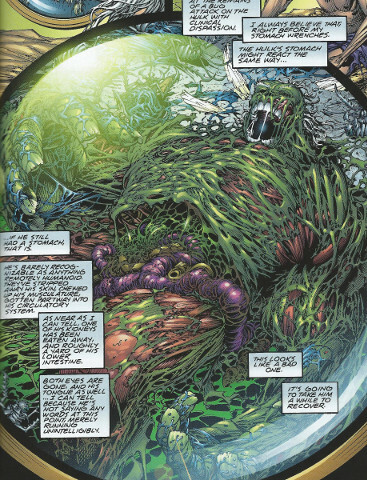 Whenever they could catch him by surprise, such as when he was sleeping, they would swarm over and feed on the Hulk, who could not hope to contend with their seemingly limitless numbers, leaving when they had their fill or were otherwise satisfied (or tired or bored), and the Hulk regenerated the lost tissue. (Ultimate Hulk novel: The Last Titan (fb)) - Banner traveled the length and breadth of the United States and explored the entire North America continent, up into the frozen wasteland of Canada; down into Mexico, past leveled mountains and destroyed monuments; and down into South America, where riverbeds were long-dried, and the remains of the rain forest were wilted and dying. (The Hulk: The End (fb) - BTS) - As his feet toughened, Banner stopped wearing shoes. The haze and the air protected him from the sun. Retaining a shred of propriety, he continued to wear some clothing; and, not wishing to see the Maestro's face in any reflections, he continued to shave every few days. The Hulk's ability to ingest virtually anything and turn it into pure energy allowed he and Banner to survive the barren Earth. 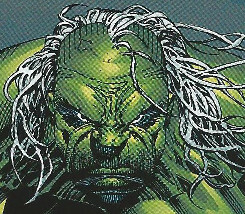 (Ultimate Hulk novel: The Last Titan) - Nonetheless, Banner's receding hair became white and brittle, his skin blistered and chapped, and he lost most of his teeth. 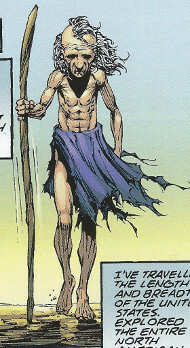 (Ultimate Hulk novel: The Last Titan) - As time progressed, Banner began to tremble; he was unsure whether it was Parkinson's disease or just nerves. (The Hulk: The End (fb) - BTS) - As the Recorder had pointed out, Banner's verbal abilities eroded over time, and he had to focus on his diction when speaking to the Vidbot. Banner eventually got to the point where he wished for death, but the Hulk refused to let him die, taking over his form anytime death threatened. 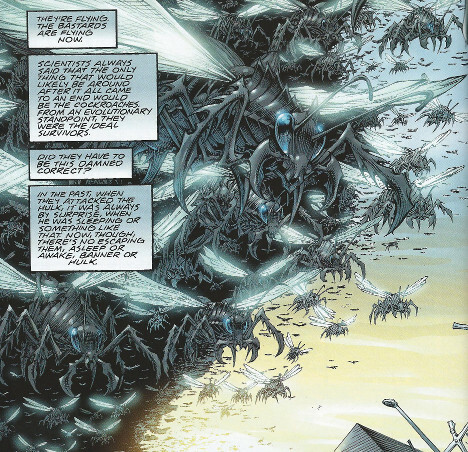 (Ultimate Hulk novel: The Last Titan) - Having gained wings and the ability to fly, the cockroaches pursued Banner, who, via instinct and habit, fled; the Hulk waited to emerge, as is enjoying Banner's terror. 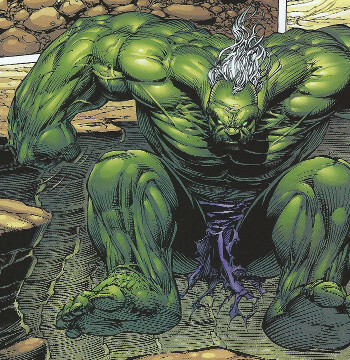 When a muscle spasm in his calf caused Bannner to drop, perhaps breaking a bone on impact, the Hulk emerged before the cockroaches could consume him. (Ultimate Hulk novel: The Last Titan (fb) - BTS) - Despite his power, the cockroaches again overwhelmed the Hulk, and it took 18 minutes for the Hulk to fully regenerate his missing tissue and organs. Upon recovering, the Hulk futilely attempted to take out his rage on the Vidbot, which, as always, dodged him. (Ultimate Hulk novel: The Last Titan) - Banner watched in amazement as the Vidbot played back the Hulk's consumption and regeneration. (Ultimate Hulk novel: The Last Titan) - The Hulk enjoyed considering how he had had the last laugh as all of his enemies (except Banner, the Vidbot, and the cockroaches) were all dead. 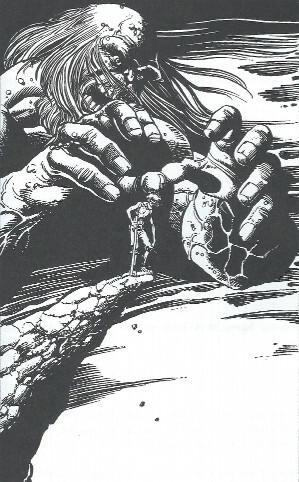 (Ultimate Hulk novel: The Last Titan) - Trying not to think about it (and give himself away), Banner suddenly threw himself off a cliff to kill himself, but the Hulk instigated the change before he was halfway to the ground and saved them both. (Ultimate Hulk novel: The Last Titan) - After dreaming about seeing a beautiful woman and becoming younger as he approached to embrace her, Banner began to have a heart attack. Feeling the pain, the Hulk fought back, ignoring Banner's pleas to let him go and to pass on with him, so they could be reunited with their friends. Refusing to want any friends or to let Banner have what he wanted, the Hulk forced the change one last time. Comments: Created by Peter David. 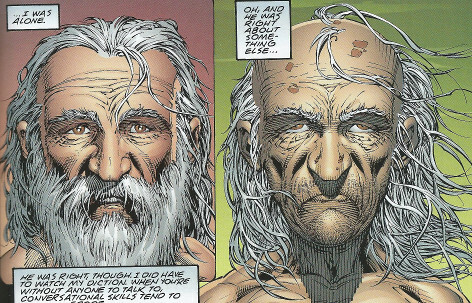 If we would estimate Banner to be in his mid-30s or even 40 in the modern era, if Banner is indeed over 200 years old in "The End," then it would be over 160 years in the future. Since it was meant to be a potential future of the Earth, one would assume anyone present on Earth-616 up the time of the 1998 or 2002 publications of this story would have been in the shared past of Earth-2081. Regardless, I am only listing those clearly referenced or pictured in the story. Additionally, we can likely assume since this is supposed to be a potential future that the real names of characters mentioned/seen are the same as their -616 counterparts...but, we don't know that for a fact, so I'm only including what we do know. The Hulk: The End substituted reference (and picturing) of the Abomination for the Juggernaut referenced by the Hulk when he thought about how he had outlasted all of his enemies. The scene where he uses the Vidbot to view the Hulk's regeneration is expanded to show Banner instructing the Vidbot to show him what he wanted, and it following his instructions. I would suggest the Recorder to be Recorder-5623. (Ultimate Hulk novel: The Last Titan (fb) - BTS / The Hulk: The End (fb)) - The Hulk (Bruce Banner) survived the Hell on Earth War, the Outer World War, and the eventual nuclear war on Eath. The Hulk's ability to resist and absorb radiation made him stronger; and the ability to repair his damaged body to counter the effects of aging, allowed him (and Banner, albeit somewhat more slowly and far less efficiently) to survive. (The Hulk: The End (fb)) - Bothered by the noise of the explosions and the cries of the dying,the Hulk returned to a cave near Desert Base, New Mexico, and sealed himself and Banner in, until all the shouting died down. Staying in the cave used little energy, and the Hulk was maintained by both the freefloating radiation and radiation-contaminated natural spring running through the cavern. (The Hulk: The End (fb)) <Days, months, or years later> - A Rigellian Recorder -- sent to confirm the reported death of humanity but having detected a survivor -- rolled back the rock covering the Hulk's cave and confronted Banner, after which it expressed displeasure at confirming that his readings were correct, and that a human had survived. The Recorder introduced itself and explained that it had been sent there -- not to learn from humanity's mistakes to help other races, as Banner first thought -- but rather to to make certain that all of humanity was dead. It further explained that most sentient beings considered Earth to be a troublesome race, which would not be missed: The Kree and Skrulls had actually formed an alliance for the purpose of sponsoring a very festive celebration. Despite Banner's initial shock and subsequent outrage, the Recorder merely clarified its points. When Banner asked if the Recorder was going to kill him to make sure, the Recorder asked if Banner wanted him to...if he wished to die. When Banner said, "No...! ", the Recorder told him he would change his mind, but then clarified that he was only there to record, regardless. Concluding that its continued presence was not required, and that its presence might actually and inappropriately affect events, it -- before departing -- left behind a Vidbot to record on his behalf until it registered his demise, after which the Recorder would retrieve it. (Ultimate Hulk novel: The Last Titan (fb) - BTS) - Mutated cockroaches periodically overwhelmed the Hulk (who would take over Banner's form in time to protect him from being completely consumed by them). (Ultimate Hulk novel: The Last Titan (fb) - BTS) - Despite his power, the cockroaches again overwhelmed the Hulk. 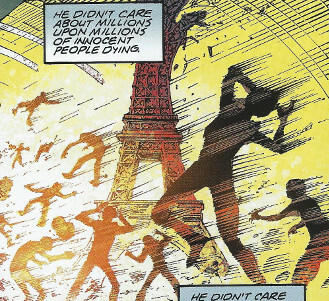 (Ultimate Hulk novel: The Last Titan) - Banner watched in amazement as the Vidbot played back the Hulk's consumption and regeneration; Banner noted that the entire process took 18 minutes. (The Hulk: The End) - Over a century later, the aged Bruce Banner, last survivor of humanity, was surprised to find the Costumed Adventurers Memorial Park still existing, though it was somewhat worn down over time. Its existence reminded him of the end of the heroic age and the end of mankind as well, and his meeting with the Recorder. Banner apparently perished, leaving the Hulk even more alone. 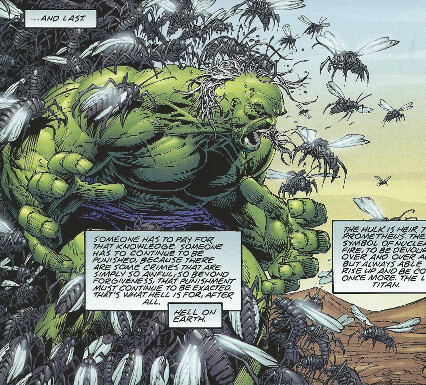 (Ultimate Hulk novel: The Last Titan) - Having gained wings and the ability to fly, the cockroaches pursued Bruce Banner, who, via instinct and habit, fled; the Hulk waited to emerge, as is enjoying Banner's terror. 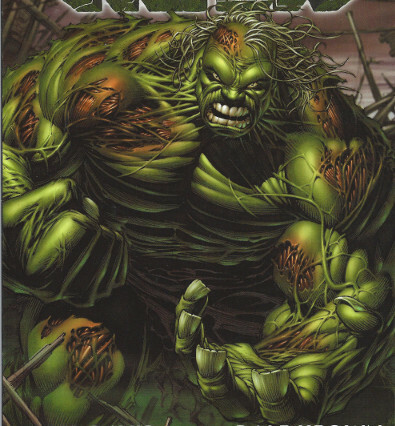 When a muscle spasm in his calf caused Bannner to drop, perhaps breaking a bone on impact, the Hulk emerged before the cockroaches could consume him. 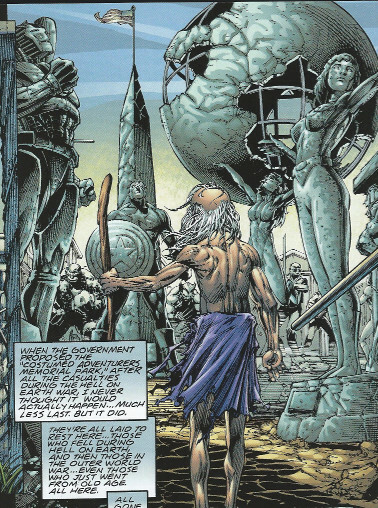 (The Hulk: The End) - Over a century later, the aged Bruce Banner, last survivor of humanity, was surprised to find the Costumed Adventurers Memorial Park still existing, though it was somewhat worn down over time. Its existence reminded him of the end of the heroic age and the end of mankind as well. 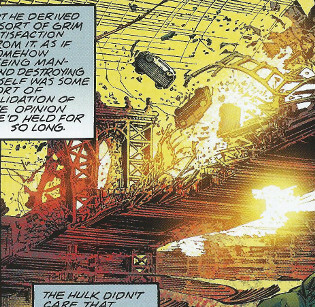 (The Hulk: The End (fb)) - The Hulk (Bruce Banner) experienced multiple varying existences, including that of the savage Hulk, Mr. Fixit in Las Vegas, and the Professor persona. (Ultimate Hulk novel: The Last Titan (fb) - BTS / The Hulk: The End (fb)) - The Hulk survived the Hell on Earth War, the Outer World War, and the eventual nuclear war on Eath. 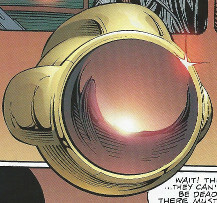 (The Hulk: The End (fb)) <Days, months, or years later> - A Rigellian Recorder -- sent to confirm the reported death of humanity but having detected a survivor -- rolled back the rock covering the Hulk's cave. Informing Banner he was humanity's soul survivor, it left behind a Vidbot to record on his behalf until it registered his demise, after which the Recorder would retrieve it. (Ultimate Hulk novel: The Last Titan (fb) - BTS) - The Vidbot followed and recorded every activity of Banner and the Hulk, always staying 10' away from them and/or any projectile the Hulk hurled at it. (Ultimate Hulk novel: The Last Titan (fb) - BTS) - Banner traveled and explored the entire North and South American continents. The Hulk presumably shared some of this time. (The Hulk: The End (fb) - BTS) - The Hulk's ability to ingest virtually anything (such as cactus) and turn it into pure energy allowed he and Banner to survive the barren Earth. (The Hulk: The End (fb) - BTS) - Banner eventually got to the point where he wished for death, but the Hulk refused to let him die, taking over his form anytime death threatened. (Ultimate Hulk novel: The Last Titan / The Hulk: The End) - The Vidbot followed Banner and the Hulk during their wanderings, dodging the Hulk's efforts to catch it. (The Hulk: The End (fb)) <Days, months, or years later> - A Rigellian Recorder rolled back the rock covering the Hulk's cave and confronted Bruce Banner, after which it expressed displeasure at confirming that his readings were correct, and that a human had survived. The Recorder introduced itself and explained that it had been sent there -- not to learn from humanity's mistakes to help other races, as Banner first thought -- but rather to to make certain that all of humanity was dead. It further explained that most sentient beings considered Earth to be a troublesome race, which would not be missed: The Kree and Skrulls had actually formed an alliance for the purpose of sponsoring a very festive celebration. Despite Banner's initial shock and subsequent outrage, the Recorder merely clarified its points. When Banner asked if the Recorder was going to kill him to make sure, the Recorder asked if Banner wanted him to...if he wished to die. When Banner said, "No...! ", the Recorder told him he would change his mind, but then clarified that he was only there to record, regardless. Concluding that its continued presence was not required, and that its presence might actually and inappropriately affect events, it -- before departing -- left behind a Vidbot to record on his behalf until it registered his demise, after which the Recorder would retrieve it. It was designed to record the Hulk and/or Bruce Banner and report the moment of their demise (indicating the extinction of the human race). It was solar-powered and was capable of detecting any motion coming its way and keeping a distance of 10 feet between itself and harm. Before departing, the Recorder instructed Banner:: "If you should happen to address the Vidbot, please enunciate. Your species has...I'm sorry, had...a tendency to mumble." (Ultimate Hulk novel: The Last Titan (fb)) - After regenerating from being devoured by mutated cockroaches, the Hulk futilely attempted to take out his rage on the Vidbot, which, as always, dodged him. 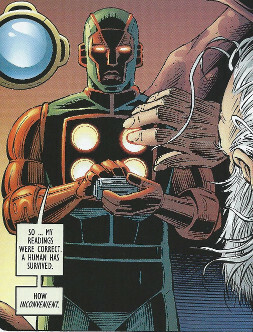 (Ultimate Hulk novel: The Last Titan) - Banner instructed the Vidbot to play back the Hulk's regeneration in real time. 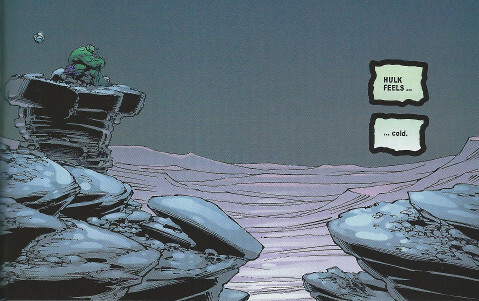 (The Hulk: The End) - The Vidbot accompanied Banner to the Costumed Adventurers Memorial Park. (Ultimate Hulk novel: The Last Titan - BTS) - The Vidbot presumably recorded Banner's final moments and the Hulk's final transformation. (Ultimate Hulk novel: The Last Titan) - The Vidbot recorded the Hulk as he seemed to appreciate, despite himself, that he was now truly alone.